LONDON — Queen Elizabeth II and Prince Philip celebrate 70 years of marriage on Monday, becoming Britain’s first reigning couple to mark a platinum wedding anniversary. The decades-spanning marriage of the Queen -- the nation’s longest serving sovereign -- has outlasted those of all prior British monarchs. The royal couple will not hold any public events but have invited family and friends to Windsor Castle for a private dinner on Monday evening, according to media reports. Earlier in the day the bells of Westminster Abbey, where Elizabeth married the Duke of Edinburgh on November 20, 1947, will ring out in full celebratory peal. The abbey’s company of ringers -- a team of 10 -- will deliver the tribute uninterrupted for around three hours and 20 minutes, from 1300 GMT. Also in honour of the occasion, Buckingham Palace on Saturday issued new photographic portraits of the Queen and the Prince, taken earlier this month in the White Drawing Room at Windsor Castle. They are framed by Thomas Gainsborough’s 1781 portraits of George III and Queen Charlotte, whose 57-year union -- bridging the 18th and 19th centuries -- is the next longest British royal marriage. In one of the photographs released, the Queen poses in the same cream dress she wore at her diamond wedding anniversary thanksgiving service 10 years ago, along with a yellow gold, ruby and diamond brooch Philip gave her in 1966. Meanwhile the Royal Mail, Britain’s postal service, has issued a new set of six stamps to commemorate the historic landmark. It includes images of the pair’s engagement announcement at Buckingham Palace, their wedding amid the splendour of Westminster Abbey, and the first part of their honeymoon at a country estate in the county of Hampshire. 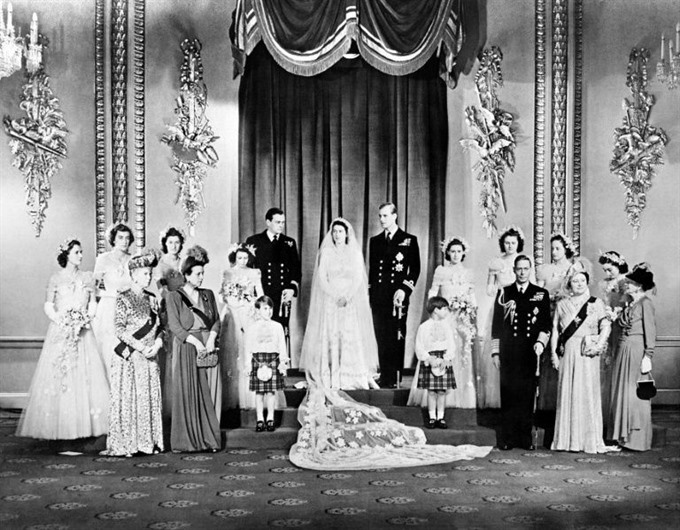 The fairy-tale royal wedding in 1947 was a morale boost during the tough years immediately after World War II. Their marriage endured, as Philip accepted living in his wife’s shadow, and the Queen seemingly forgiving his periodic gaffes. They had four children -- Charles, Anne, Andrew and Edward -- though their marriages have been less successful, with all except Edward having divorced. The couple also boast eight grandchildren and five great-grandchildren, with a sixth great-grandchild expected in April, when Prince William and wife Kate Middleton’s third child is due. The 96-year-old Duke of Edinburgh retired from the public eye this summer, enjoying his newfound free time reading and painting. For her part the Queen, at 91, is slowly passing over some of her official duties to her son Prince Charles, now aged 69. The royal couple first met as teenagers, and eventually married when Elizabeth was a 25-year-old princess. Philip, the son of a Greek prince banished from that country, renounced his titles and Greek Orthodox faith and became a British citizen in order to marry, adopting his mother’s anglicised name, Mountbatten. Prior to the wedding he told the Queen Mother he had "fallen in love completely and unreservedly" with her daughter.